Despite playing only three years of Independent baseball, Joe Maloney will go down as an all-time great. Followers of the indy game are well aware of that and so are the Baltimore Orioles. The Orioles signed the 2015 Baseball America Independent Player of the Year and two-time CanAm League MVP to a minor league deal. 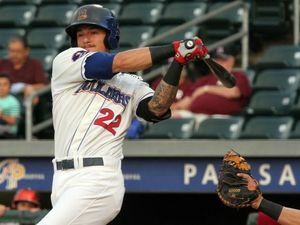 Maloney was drafted by the Texas Rangers in the 10th round of the 2011 MLB June Amateur Draft from Limestone College. He spent the first three years of his professional career within the Rangers system, but his success in college didn’t necessarily transfer over to the pro game. Excessive strikeouts and an average that never surfaced above .250 ultimately led Maloney to the Rockland Boulders of the CanAm League. In his second season, Maloney put together his first MVP campaign when he hit .337 (2nd in the league) with 14 home runs (fourth) and drove in 83 (second). After two years in Boulder, and a combined 31 bombs and 49 doubles, he inked a minor league deal with the Minnesota Twins. Unfortunately, Maloney’s numbers weren’t as they were were in Rockland, in fact they were substantially lower; .256/.322/.383 with 28 doubles, six home runs and 51 RBIs in just over 110 games. He also fanned 142 times in over 450 times at the dish. After his release from the Twins, Maloney headed back to the Boulders where he put together, not only the best season of his career, but one of the best seasons in CanAm and Independent League history. His 35 home runs broke the previous league record of 31 dingers set in 2005 by Eddie Lantigua. To put that in perspective, Maloney was going deep every 10.6 at-bats. He led the league with 101 RBI (second best in league history), 18 ahead of the next closest player and led the league in OPS (.997). No doubt, the guy can hit, which is why these upper level opportunities continue to present themselves. In addition to his bat, Maloney is a versatile defender with the ability to play the outfield, first base and catcher. Dan Duquette, Orioles executive vice president, also commented on his abilities. He’s expected to start the 2018 season at Double-A Bowie.